"Is it lucky, or is it giving luck?" - A heroine wondering. A harmless little cousin of the dreadful Ninja-starfish, the Lucky starfish can be easily recognized by its green color, its star shape, and the four-leaf clover fixed on one of its arms. It is said to be a sign of good luck to see or possess one of those very special starfish. 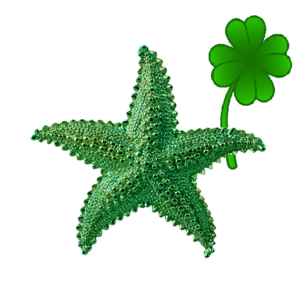 Studies says the Lucky starfish, once it has fertilized, climbs on land to find a four-leaf clover for unknown reasons. Its methods for surviving outside the sea, its natural habitat, remain quite the mystery at the moment. We only know that its green pattern works as a camouflage in grass, allowing it to find its target (a.k.a. the four-leaf clover) without worrying about predators. Once it has located a four-leaf clover, the Lucky starfish will usually wait in plain sight to be collected by passersby (often heroes or monsters) attracted by the plant's reputation as a lucky charm. This strange behavior, and its reputation as a possible lucky charm, make the Lucky starfish a worthy study subject. For this reason it is researched by scientists, zoos and heroes, which in turn raises its price on the market. This page was last edited on 2 March 2019, at 19:12.